This interview took place in April 2014. JFH (Holly Marie): Can you tell us about the band name Renevus? What does it mean? And how did you come up with it? Gideon Roberts: Renevus comes from Latin - "nevus" means "birth mark" and "re" means "again." It indicates that when we come to Christ, we are made brand new with a completely transformed identity. When the band was in its beginning stages, we wanted a unique name that conveyed a lot of meaning. JFH (Holly): How/When did Renevus start? Gideon: The idea behind our band began in the spring/summer of 2010. I partnered with some friends to start a band and ministry that would authentically communicate the Gospel and to create unique and fresh music. Over the next 1-2 years, the band went through a series of changes that left only two members remaining, me and Christian Tristan (electric guitar). In the spring of 2012, we began to see real progress, and as of , we have released an independent and co-produced EP, later followed with the single "We Will Rise" in July. The band consists of myself (Gideon Roberts), Christian Tristan, Mitch ViVenzio, Tyler Jack Polinski, and James Fulmer. JFH (Holly): What are the top things that you all hope to convey to those that you come across as a band? Gideon: Christ. It all comes down to Christ. Sure, we want to be an awesome band and be excellent in everything we do. But we want that to pale in comparison to the significance of Jesus. If people leave a concert with only an impression of how great our music is, then we've missed the point of why we come together as a band and ministry. We hope every person that comes to hear us and talk with us sees the person of Christ in us. JFH (Holly): The band has seen some changes over the past year and a half. Would any of you care to share some highlights and/or lessons? Gideon: We have definitely had our fair share of changes - Band members, style of music, and most importantly, the changes that have changed us. One highlight was a change in our roster over a year ago. William Flato and Daniel Lockerbie, our previous drummer and bassist, respectively, went away to university, leaving us with some big shoes to fill. A few months later, we were blessed to have not two, but three new band members join us. We have been playing together ever since. On the other hand, a lesson we have learned is communication. Communication is huge in any type of relationship. Take marriage as an example. If spouses don't communicate, the marriage can become unhealthy. The same is true for other types of relationships, band members included. We have learned to talk more and talk often - to make sure we are clear with each other and to always remember to build each other up so we can grow not only as musicians, but as believers. JFH (Holly): How would you describe your sound for those who've yet to hear Renevus? And how do you hope to set Renevus apart from other bands in your shared genre? Gideon: Indie-rock Worship with hints of folk, blues, classical, etc. It has always been a bit of a challenge to classify our "sound." That's probably because we typically create the sounds in a song based on its message or theme; to paint with a broad spectrum of colors to show different dimensions of the songs. We love to use unique instruments and sounds with a lot of ambience. Gideon: The song "We Will Rise" came from a time of tragedy. After the Colorado Batman premier shooting in Aurora Colorado July 20th, 2012, I recognized one of the names on the list of victims. It was someone I had gone to school with and the tragedy hit home and really became a time of mourning for the entire band. However, that mourning turned to joy when we looked to the hope that we have in Christ. With the song, we wanted to do more than just put it up on iTunes or merely be something that benefited us. We wanted the song to be a blessing to others. Originally, we were looking to assist a charity that had given aid to those affected by the atrocity in Aurora. Later on, however, God had opened a door to partner with Feed My Starving Children through a friend. We partnered with Texas Mobile Pack, the meal-packing branch of FMSC, and decided to give half of the sales to the organization. They recently had a packing event where they packed nearly 420,000 meals in only two days. That's enough to feed 1,150 children for a year. We're excited to help in any way we can, especially for next year's goal of packing four million meals for children around the world. JFH (Holly): What other artists/music inspire you as a musician and in your life as a believer? Gideon: Gungor, Future of Forestry, Switchfoot, Bellarive, Rend Collective, Citizens, Kye Kye, and Phil Wickham have all been great influences to us as Christ-following musicians. Some of our greatest inspirations as believers are Shawn McDonald, Daniel Bashta, Jimmy Needham, Rich Mullins, Hillsong United, King's Kaleidoscope, Elevation Worship, and David Crowder. JFH (Holly): What's next for Renevus? Gideon: We [have recently released a] new studio EP, "We Will Rise," named after our single. Recently, we were fully funded in a Kickstarter project to be able to record the project. We [released the record in May]. We are also looking to record a music video in the very near future, Lord-willing. The music video will likely be from a song from our EP. Lastly, [we've been out on a] Summer tour and [have been] booking youth camps, music festivals/events and venues, and church concerts. Along with this, we will be investing into the local church and youth in San Antonio and Austin. Our hearts' desire is to invest into as many people as we can. JFH (Holly): What has God been teaching you lately? Gideon: As a band, we have been reading and praying through Ephesians together. There is so much about identity in the epistle and understanding our place as citizens of God's kingdom and members of his very household. Understanding our identity as believers and the glory it is to live for Christ and his unshakeable kingdom. We have also been learning and re-learning that it's really not about the music. It's about worship - no matter the genre or style of a song or artist, we're called to worship and to demonstrate Him beyond the music - such as being more intentional in using scripture during shows and worship times. Worship is a lifestyle choice of looking to Christ. JFH (Holly): Any Final Thoughts? Gideon: Thank you so much for allowing us the opportunity to be interviewed for your site. JesusFreakHideout.com is considered to some a staple and we are honored to be a part of it. Also, don't forget to check out our EP, [which released] May 3rd. Most importantly, never forget that Jesus loves you! God bless! 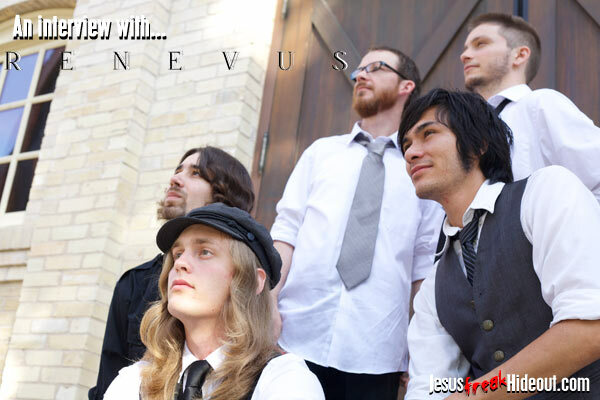 Find out more about Renevus at www.renevus.com and you can buy their EP We Will Rise now on iTunes.